Somehow, despite being mostly mute for his evaluation to confirm he was "typically-abled", Timmy earned a spot in the new integrated pre-school program at our elementary school this year. 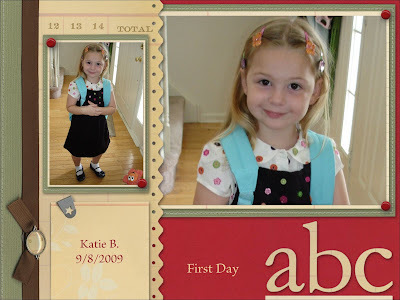 Katie started in this program as a 3yo for speech delay and I was eager to get Tim into such a well-structured program. When we found out they would allow kids without delays or special needs to enroll this year, I was ecstatic. It sounds like he's already making a name for himself. Although, I had to laugh when the head teacher (like an assistant principal) told me a few weeks into school, that yes, she knew my youngest had started in pre-k this year. She knew Katie as a preschooler and has been extremely helpful to our family over the years. She told me, "Oh, I saw him get off the bus the first day and instantly recognized that face. I knew he must be a Bouf." But that face is where the similarities end. Timmy is the opposite of Katie in so many ways. He's naturally athletic (with speed and coordination). He's also naturally shy and quiet in new situations. He takes a while to warm up to new people, but once he does he's loyal and loves to play with his friends. He's quiet about what he knows, often just telling us, "Ahh, I don't know". Even though he does. He carries a tune well and loves to parrot back every commercial and one-liner he hears on tv, but refuses to perform on command. All of a sudden he turns into Mr. Bashful. Maybe she enjoyed the e-mail and told Timmy to give his mom a break tonight and just sing the alligator song for her. Because, not only did he sing the alligator song he's been talking about since the beginning of September...but he was enthusiastic about me recording it. I'll get him there...he's already telling me he'd rather go to NYC to see Wicked (since I told him we can't see Jack in Newsies AGAIN) instead of his much requested Disney vacation. He belts out Defying Gravity, Just One Day, King of New York or Santa Fe, depending on the CD playing at the moment, on almost every car ride. Good luck getting him to sing them for you. But for one show only...here's the alligator song!! !